You are cordially invited to Bella Rustica. See you there! Ohhhh man. Is the US of A ready for yet ANOTHER visit from a humidity freaked out Canadian? YOU BETCHA! But it’s a little more than that. 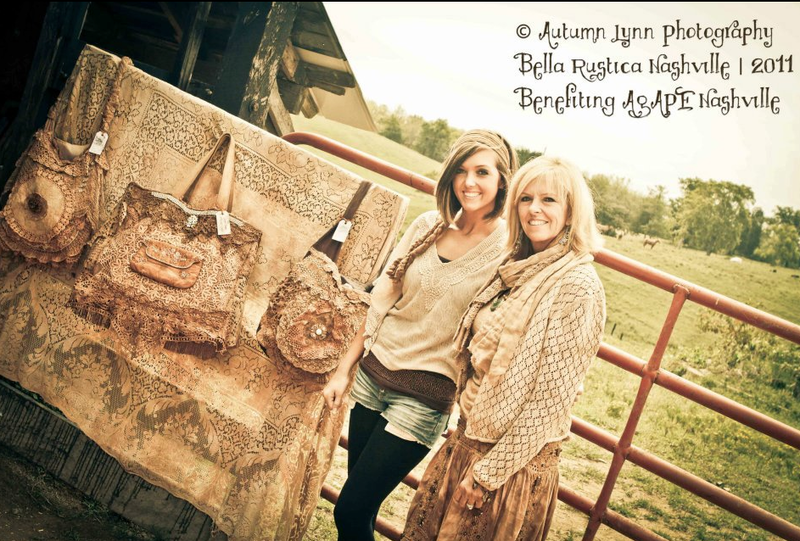 I’m going to be a guest at Bella Rustica Vintage Barn MarketPlace! As in, on a stage and everything…. Ohhhh goodness. So… hmm… what can I teach or talk about? I got it! Maybe some beginner photography staging tips. Or a little junk staging challenge. An inspiring story or 2? Know what? It’s gonna be a surprise. But it’s going to be FUN!!! Word also has it there’ll be a few of your fav bloggers in town at the same time so we’re planning on doing something together on stage. Update coming soon! 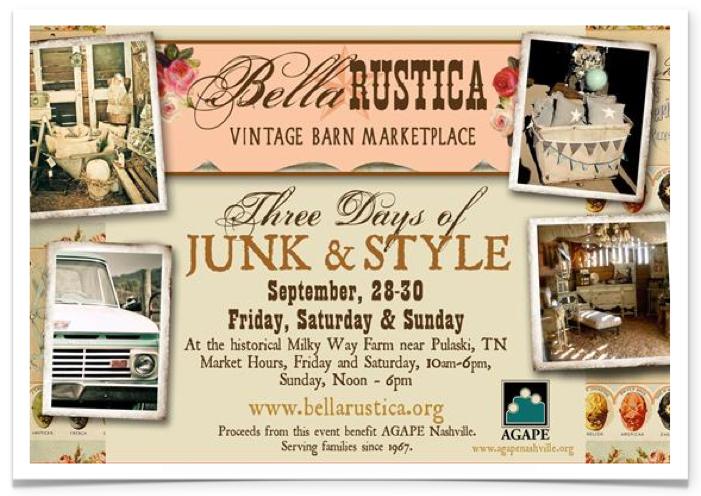 Bella Rustica is a vintage show that transpires once a year in Tennessee. 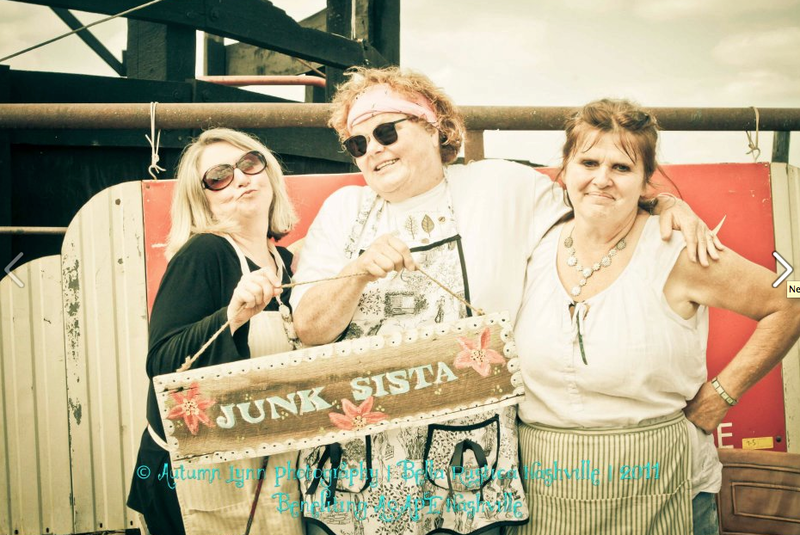 Venders from all over the Southeast come on over and pull out all the stops, creating a fun event of junk, food, music and just a great ‘ol time. Sept 28 29 30, 2012! It’s a big 3 day event! 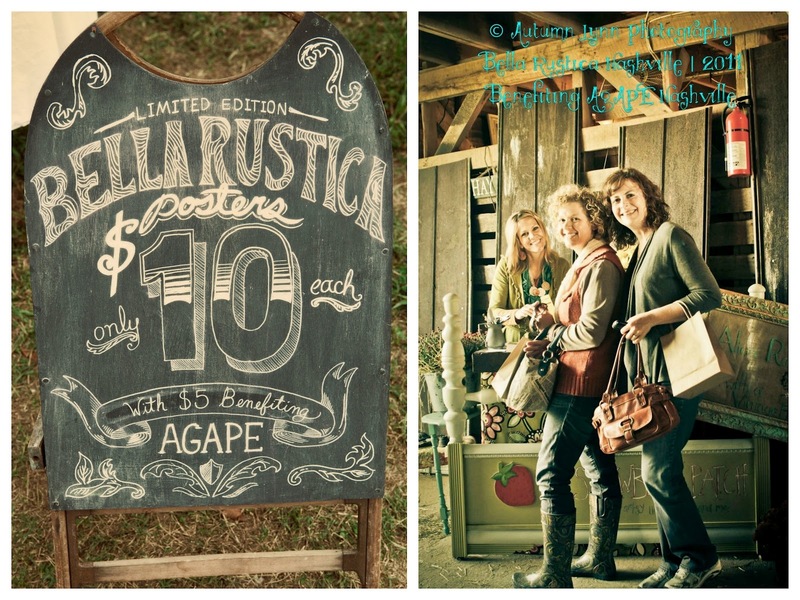 Bella Rustica is taking place at the amazing, historic Milky Way Farms. 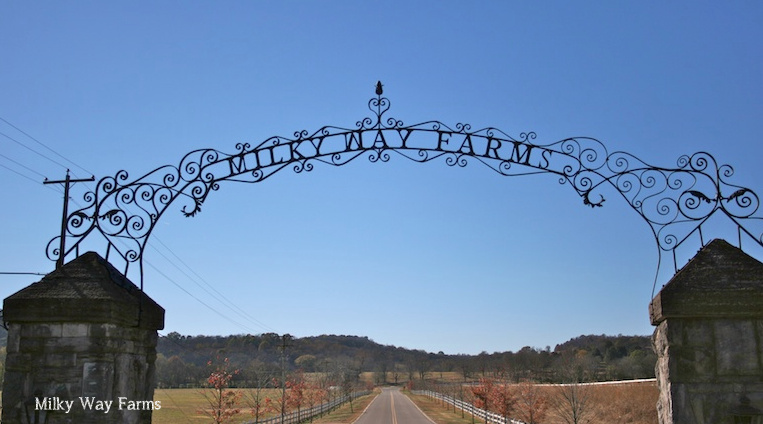 Set in rural Pulaski, Milky Way Farms is on 1000 acres of gentle rolling hilled gorgeousness. And the drive out is much the same. I was pretty much there a month ago and was not ready to come home. So don’t wake me up if this is a dream, because I’m soooo not done with the sweet folks, sweet tea, funnel cake, grits and talking trees. I’ve yet to see a firefly. Hear that Lin? I AM STAYING UNTIL I SEE A FIREFLY. So someone better fake one if they’ve gone out for the year. 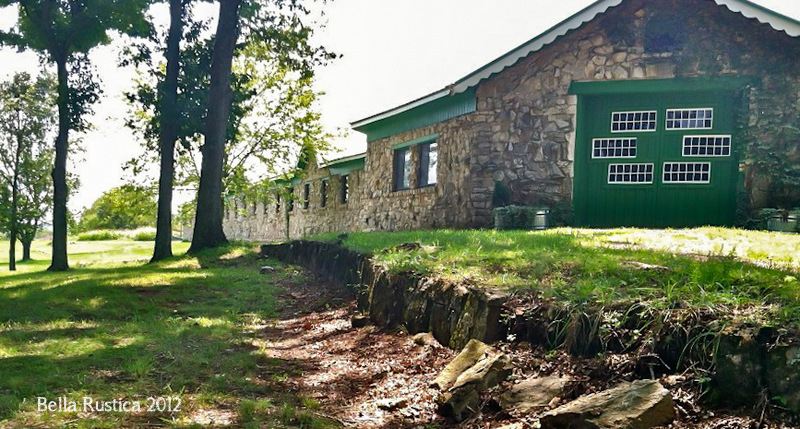 These amazing barns have been here for decades. They’ve been lovingly restored and are open to hosting events year around. 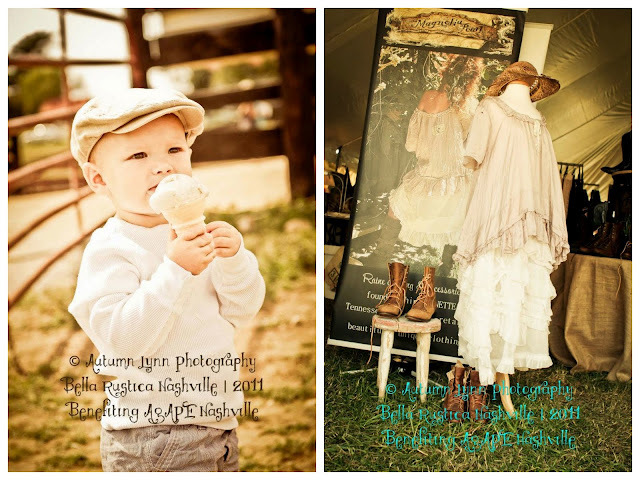 The vintage show is going to take place in what’s referred to as The Show Barn. I want to LIVE in that. Imagine if you will, tables filled up to the rafters with the most amazing vintage must haves. In a real barn! Check out those stone walls and rafter beams. Talk about atmosphere. Yeah. No kidding. That’s just a real good time waitin’ to happen! So here’s the best part on why this has all come about. Bella Rustica is a really cool and today kinda way to raise funds for Agape, a Tennessee based organization that offers support and placement for foster and adoptive families. My own son is adopted, so I get it. I know about the struggles of waiting for years to have a child, and what it feels like to have that special day finally arrive. But then there’s the adoptee parent’s side. They also need a huge amount of support to come to terms with making the right choice. And let’s not forget about the foster option. It truly takes a village of wonderful supportive folks to make placing a child happen. I just truly couldn’t be happier to be a part of this cause. It just fits. I’m not doing this alone. 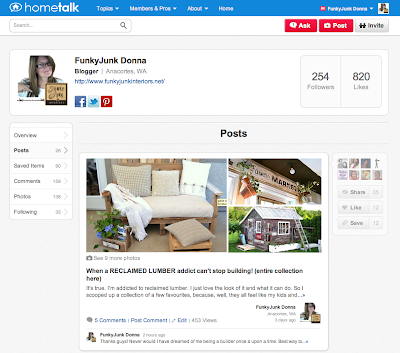 My travel expense were donated by HomeTalk, a community for sharing all things home and DIY with pro help on board. For free! Have you been for a visit? Come on over! Warning: you might not leave. 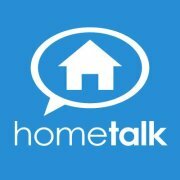 Thank-you for your big hearts, Hometalk! This is so amazing. So I am offering my time for free for a week to help prepare and take part in this event. So why me? Well, I asked that too. And Lin said I was the right one for the job. 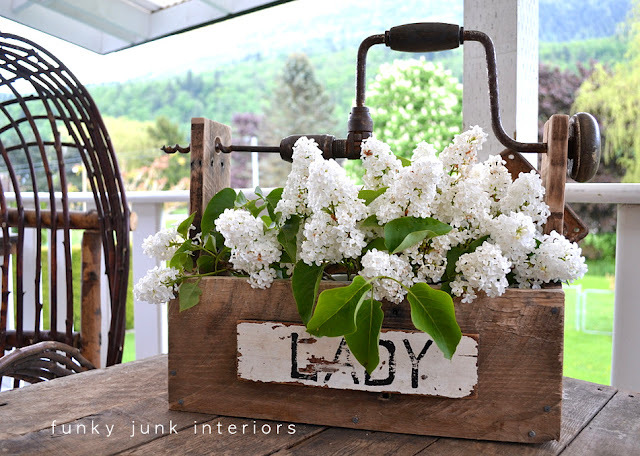 I loved junk, I loved making stuff with it, she knew I was into inspiring others and the cause fit like a glove. So, let’s do it! Will you come too? Because dag nab it, when else can I meet you? This would be so awesome! This round it’s all ABOUT meeting you! I’ll be there for 3 days, so why not come on out, bring your friends and join us while supporting an awesome cause? 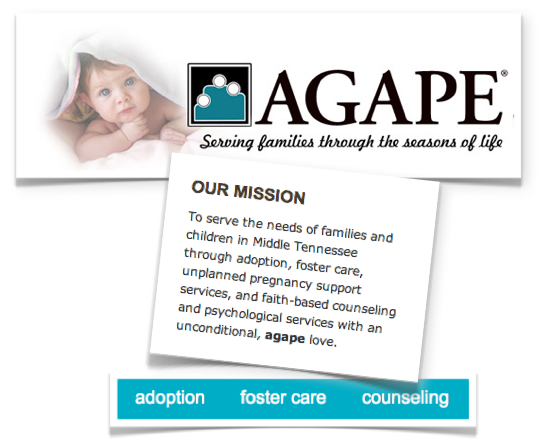 100% admission fees are going towards Agape. There will also be some fundraising events inside the gates. Would you consider sharing this post and button to help spread the word? Sounds like a wonderful time! Wish I could be there too! So excited for you! And those barns! Amazing. Hope you have the best time ever! P.S. Is “you betcha” a stereotypical Canadian saying? cause…. I say that all the time and it just never occurred to me that it was more than just a super fun sounding phrase. I thought if I steered clear of the “eh”s most of the time then I was good. Joke’s on me! Haha! I’m not sure! Truth be told, I don’t even say eh all that much. Or doncha know. I’m training for y’all myself right now. Gotta get with the program here! Donna you are going to FREAK over Milky Way Farms. We shot a couple TV episodes (for my employer who had a horse training TV show) there a couple years ago. The property is absolutely stunning. 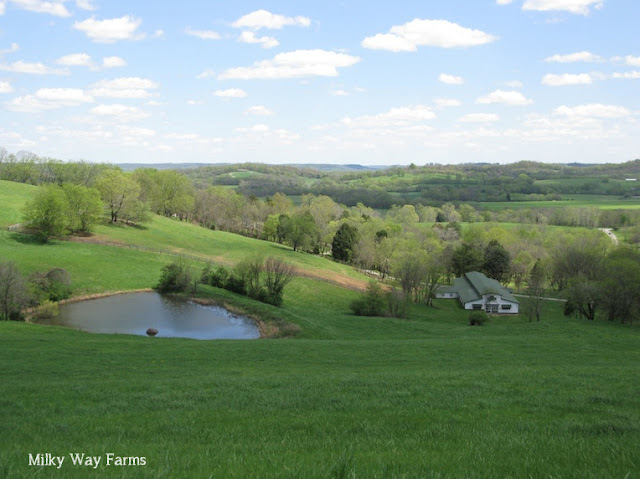 The original house is full of such charm and the BARNS… Oh don’t get this horse girl started on those. Tuh-Die-For. 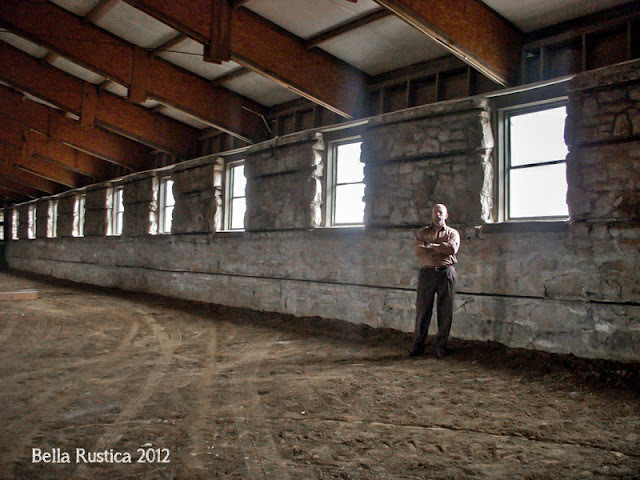 They have a round arena in one of the barns that I wish I could have taken down stone by stone and brought home with me. Sigh…. Have a great time!!! Cool! I’m already freaking from the pictures! It’s soooo gorgeous in Tennessee, period! Squee!!! I live about an hour away and had no idea this was in Pulaski!! I’ve only been in this area for about a year. I might just have to take a Saturday drive over to Giles County! Well, have fun! Looks like an incredible event. And you are the right person! You’ll blow them all away with your creativity. 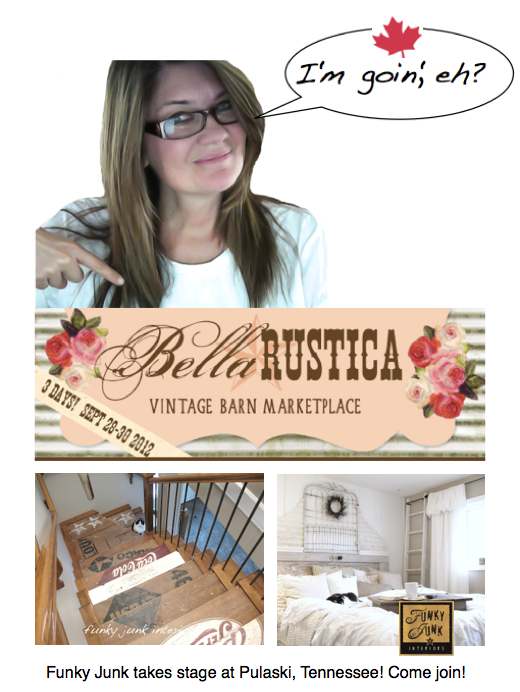 This will be my first year as a Bella Rustica vendor and I am SO excited. I am new to the Nashville area and was told by nearly every local artisan I ran into that it’s a MUST. 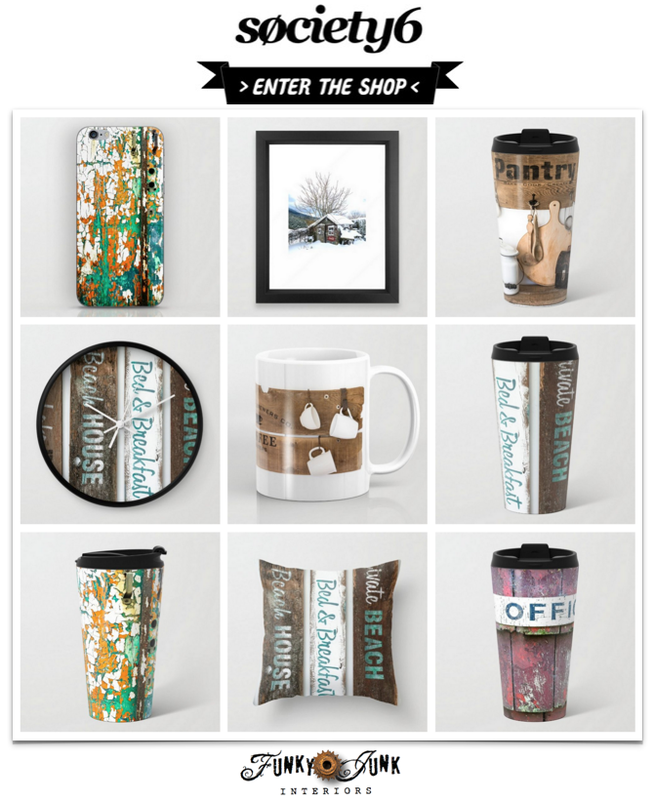 It will be hard to run a booth with so many fantastic opportunities to shop! awh! how fun is that? looks like a fabulous time, wish I could go…I was just in Tennessee last month, it is so beautiful! 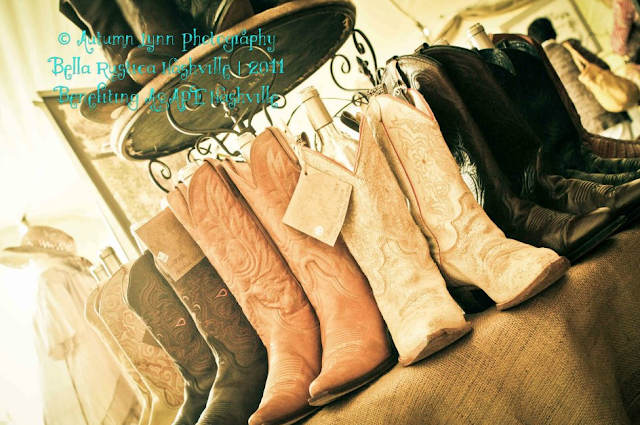 those barns are drool worthy, we have some pretty barns in Fort Worth, that host flea markets. 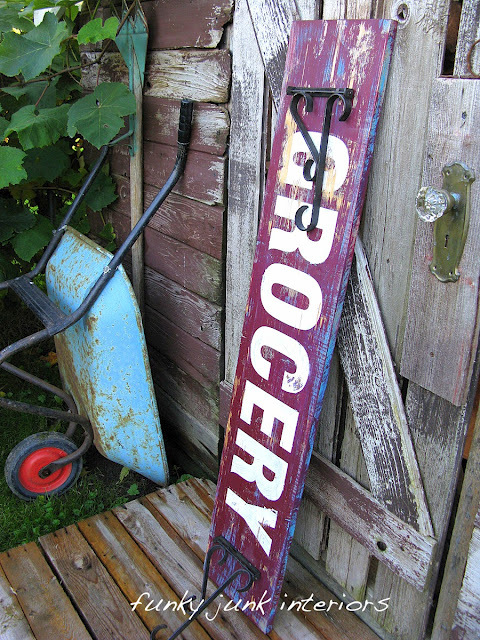 nothing like shopping for awesome junk in a show barn! yeehaww!!! I am so happy that you are getting to experience such a beautiful place for a beautiful cause. I’m sure that you will be spectacular and I hope that you will be able to share with the rest of us. Have a great trip. Do ya think the Americans will let you in AGAIN? 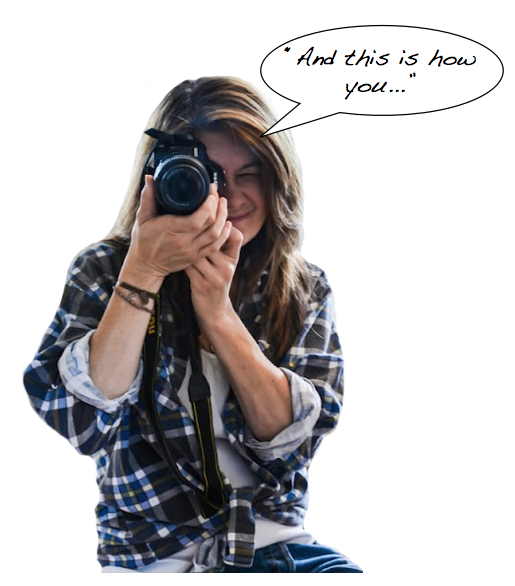 Just kiddin’… you GO GIRL!! Oh!! I am so excited you will be there! 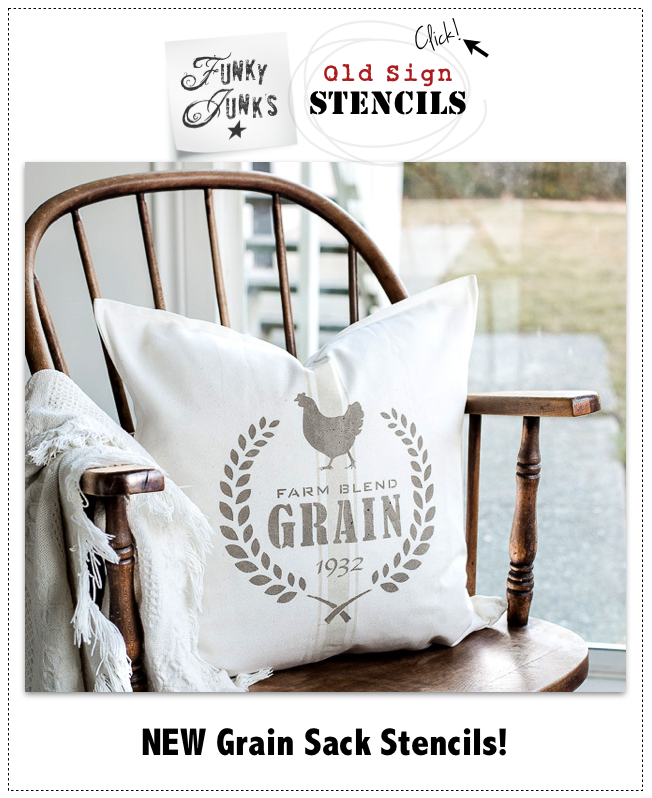 I also will have a booth in the barn and it’s my first year for this show! It’s been so exciting getting ready for this show! Look forward to meeting you! Please stop by our booth and say hello! We are Turning Leaf Crafts! http://www.turningleafcrafts.com or just look for us on Facebook- http://www.facebook.com/turningleafcrafts. Ive never heard of you until I saw it on Pinterest. I must check out your blog to see if it is worth attending. I speculate I’ll hear lots of that! And that’s ok too, because my message is pretty universal. I’d love to come, if I lived closer. I’m sure whatever you do will be a blast. Get well soon doggie… 🙁 Three weeks is a long time for a pup to be calm. I hope he/she cooperates with doctor’s orders. I’m sooooooooo excited!! I have been waiting for Bella ever since the last one, and I nearly fell off the couch with excitement when I saw you were going to be there!! You seriously ARE the perfect one to do this! I can’t believe we are lucky enough to get you to come down here to Tennessee! I have to say, if I’d had to guess which of my favorite bloggers would be coming here, I probably wouldn’t have picked the Canadian! At least not until your last trip down south! But YAY so glad it is you!! Hopefully it’ll have cooled down some…it was still kinda hot last year! I’m sooo soooo excited! I’ll be shopping on Friday probably….hoping to be a vendor sometime in the future if this keeps going (and I don’t see why not! ), but I don’t have much time to blog or junk right now with a new baby (who will probably be there strapped to me!) and a two year old! Someday I’ll find some time!! Again…..SOOOOOOOOOO excited!!!!!! I just wish you were going to be selling stuff because I’d LOVE to have some funky junk!!!!!! Maybe you can make stuff in your demos, then auction it off for Agape, or give it away! Wish I could make it down there. I’m really from Franklin, and it would be great to visit family and a great party all at the same time! How fun is this going to be? Have a blast Donna! Can’t wait to meet you! It is going to be a blast! I am so excited you did a post on this and will be there! I saw an ad in a magazine and was thrilled that I could attend my first barn sale since it is less than an hour away! We just made plans to go yesterday and then I saw your post. How amazing it looks… I hope I will get to meet you! Oh wow. This sounds fantastic and what a good cause to support. Have a junk’tastic time Donna! I will be there and I will look for you! 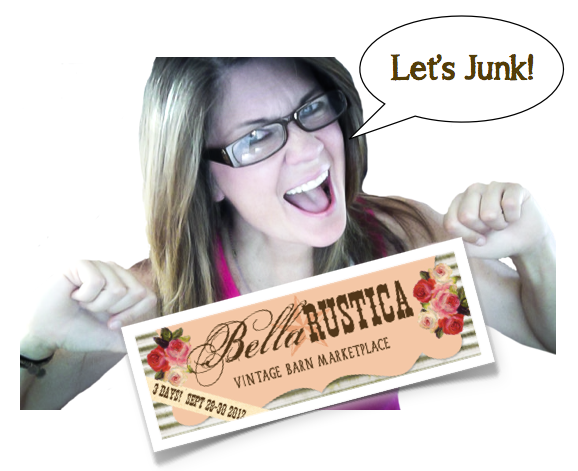 I love your blog and I am so excited to do some Junkin’ for a good cause! Oh my goodness how fun!!! I want to go soooo bad!! Ohh I get nostalgic! 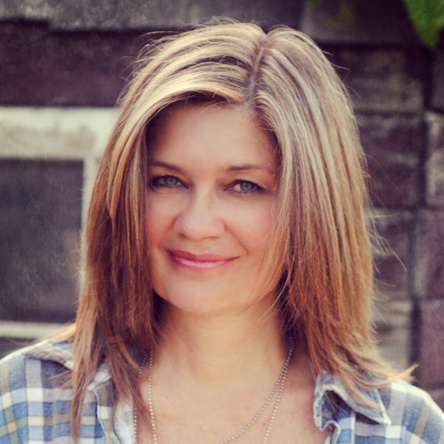 I lived in Nashville for 6 years… is the best place! Now I am far back in my country in South America but… with passports ready to move to Canada! I´m sure you will have a blast! people in Tennessee are the best and you will fell at home!! 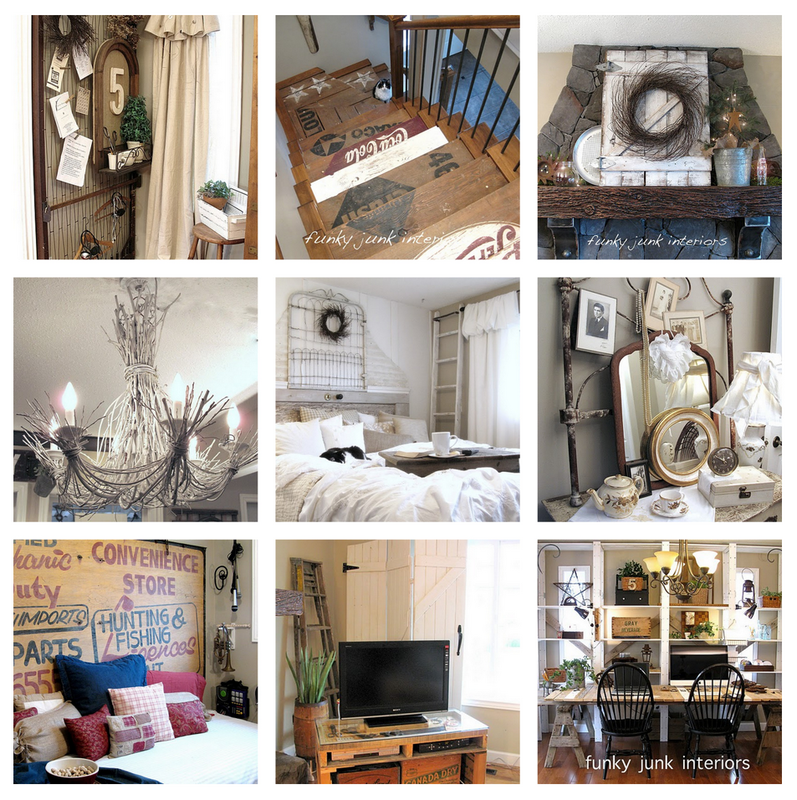 Love your blog and hope you have a great time! perhaps next time I will be there too!